Shavuot, the Holiday celebrating the giving of the Torah (Old Testament) on Mt. Sinai, is a little celebrated Jewish holiday in the diaspora. I won't get into the traditional aspect of the holiday here but would like to share the unorthodox way we celebrated the holiday in Israel. In the 'hoods', and I believe widespread throughout Israel, people will throw buckets of water at each other. On rare occasions someone will get egged but it has no significance whatsoever to the holiday, probably started by a hoodlum (hoodlum; so old school!). If I happened to be out and about that day, my objective was to swiftly make it from point A to B and back, without getting soaked by a bucket or a water balloon or worse, egged! One year, even my mom joined in the childish mischief. She stood on our balcony on the 2nd floor and tried to lure my friend into the courtyard below, under the pretense of a serious question. She then dumped a bucket full of water directly over her head, or did she miss my friend by a few inches?! My friend would be suspicious 'Dinah (that's my mom), you sure you aren't trying to trick me?" My mom then in turn, might or might not sworn on everything, including the bible, speaking of the Torah, and her children, that's us six, that she isn't. While all along she had buckets full of water, pots and vessels of all sorts that can possibly hold water, lined up by her feet to swing in full action. A little respite from adulthood. This water festival tradition of sorts was first celebrated by Jews in Libya and Morocco, and possibly by other Northern African Jewish communities. Water was likened to the Torah. The water quenches the body like the Torah quenches the soul. Water was also believed to bear mythical virtues such as a promise of health and a blessing with a brood of offsprings. It was (still is) an unorthodox custom of epic proportions, as unorthodox, as the Costanza's Festivus, airing one's grievances. 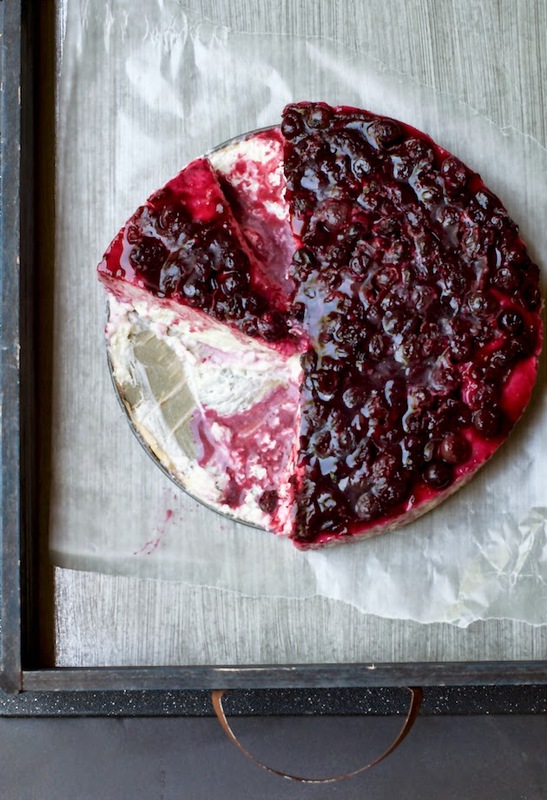 So what's to this Shavuot holiday and blueberry cheesecake?! 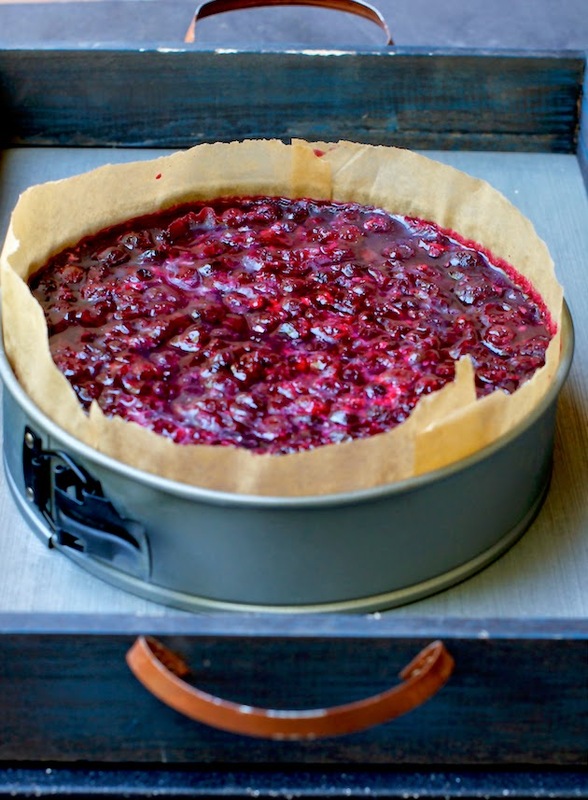 Find out at my food memory writing over at Jewish Food Experience how dairy and milk's connection to Shavuot in the 'Nostalgia Tastes Like Blueberry Cheesecake' writing here and get the 'No-Bake Blueberry Cheesecake' recipe here. You don't want to miss either. No bake cheesecake is my favorite because it's so creamy! No bake cheesecakes are definitely fantastic, especially when the weather heats up. But the blueberry addition? Oh man, that pushes it over the edge for sure. Your mother sounds so fun. Love it! And the cheesecake looks delicious too. OMG this looks amazing! i have to give this a try for my friends going away party. Hm. Can I get this cheesecake dumped on me, instead of the water? On second thought, it's been in the 90's where I am (EEP), so I'll take the water and the cheesecake...LOVE that it's no-bake! I love to hear about family background and yours is truly that, and the cheesecake looks beautiful too! No-bake desserts are the best in the summer- my kitchen has approximately zero ventilation! I always learn something interesting from your blog posts! What a fun and mischevious way to celebrate! I'm off to get the recipe now. Thank you for this easy and delicious recipe! Such a beautiful cheesecake! And I love that it's no bake! This cheesecake is beautiful! I love the purple hue of the blueberries. I've actually never made a no bake cheesecake, but I think it's time I tried. This looks delicious w/ those blueberries! I love no bake cheesecakes! They are my favourite and this one looks amazing! This looks absolutely wonderful! A must for the summer! I love it when a cheesecake is no-bake. Mine always crack down the center when baked- very annoying. And the blueberry topping looks wonderful! I love everything about this! Blueberries, cheesecake, no-bake! Fantastic! I don't think I've ever heard that part about Shavout! Interesting the different traditions here in the States and in Israel. Now on to this cheesecake. How beautiful! What a fun memory. I love that you can look at your mom that way and see the fun side of her. Now that I'm 'older' and have a little one of my own, I hope that some day she'll remember my goofiness. It looks divine! A wonderful spring treat. What a gorgeous dessert! My family would adore it! And I love the story about your mom the mischief maker...what a fun lady! Lol, your mom sounds like a hoot, Shulie! (speaking of old school language, I think "hoot" falls into that category as well). And this dessert is seriously gorgeous - that deep vibrant purple looks so beautiful against that creamy, luscious cheesecake! Beautiful photos and wonderful post!